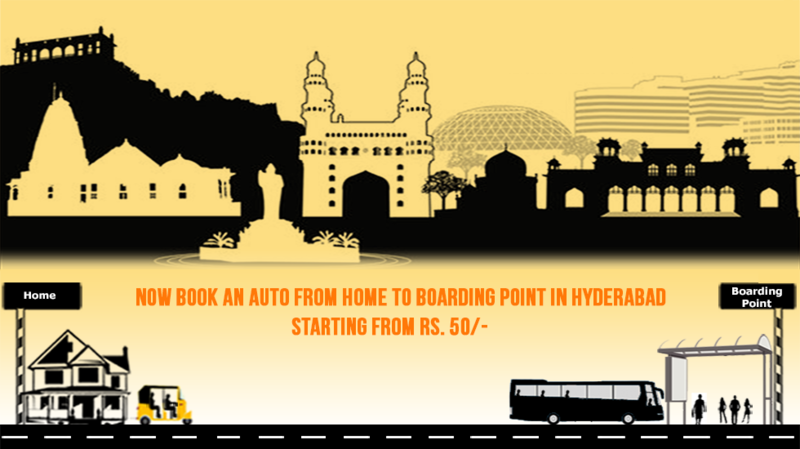 Book auto to boarding point along with bus ticket online etravelsmart in hyderabad with discount. www.eTravelSmart.com is always ahead of its competitors in providing better services and adopting new innovative ideas/technologies like partial payment booking by just paying 20%, bitcoin digital payment, smart travel help, free deals worth of ticket fare, travel kit, travel recharge, reward points, etc with an aim of making online ticket booking easy, intuitive, user friendly and smart. Now we come up with yet another convenient auto service for customers who are booking their bus tickets from Hyderabad to other places.Auto facility is a value added option given by eTravelSmart.com in association with www.autohona.com to its valued customers. Autohona is a young and energetic company based out of Hyderabad, provides a simple, easy-to-use Auto rental services. 1.Customer has the choice of selecting the Auto facility at www.etravelsmart.com while booking their bus tickets to reach the boarding point from their home. 2.Currently this facility is available only in Hyderabad/Secunderabad cities. 3.Customers will receive a separate confirmation mail from eTravelSmart with their Auto booking details. 4.Booking details will be notified to www.autohona.com immediately. 5. Customer will receive communication from Autohona in advance regarding the time of pickup (Via call or SMS). 1.Customer will receive communication from Autohona in advance regarding the time of pickup (Via call or SMS). 2.It is Customers' responsibility to ensure that they are available for pick-up at the specified times. 3.In the best interest of other customers, in order to avoid inconvenience to fellow passengers and to ensure all pickups are on time, the auto driver will not wait for more than 5 minutes at the customer pick-up point under any circumstances. 4.In the unlikely event that the customer is unable to make it on the scheduled time, the amount paid by the customer will stay as credit with Autohona, the customer can avail a ride for that credit amount with Autohona. 5.A maximum of two customers are allowed in a single auto (incl of luggage), Every third customer will require booking of another auto. 6.Customers are picked-up on a pooling basis. Customers are requested to co-operate as it increases efficiency during peak hours. 7.For any feedback/complaint/ status update may be obtained by contacting 8187896865 or Autohona customer care at 040-6723 2030. 8.The above terms are subject to change without notice.